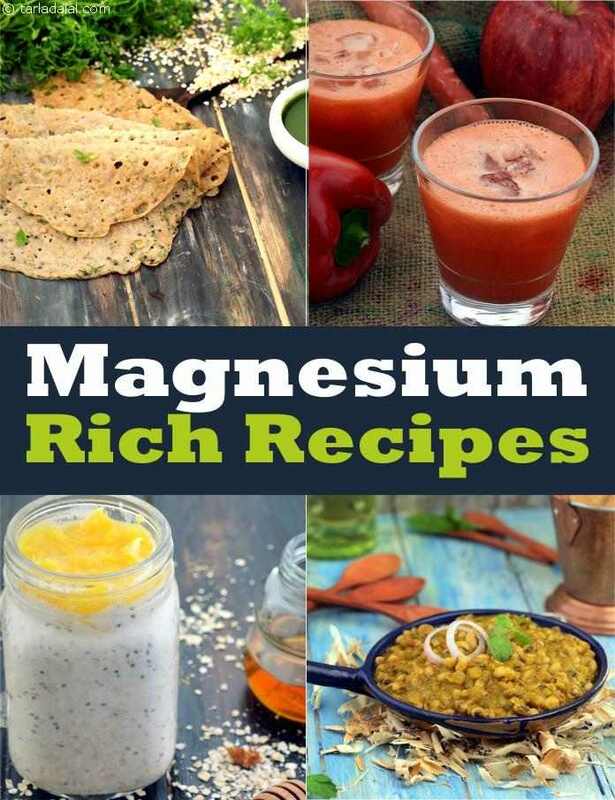 Magnesium, though present in small concentration, it forms a part of every cell of our body and is involed in about 350 biochemical functions in our body. It is usually stored in the bones and is an important mineral for our body. Requirements of Magnesium per day are 350 mg/day which can be got from cereals, green leafy vegetables and nuts. Please refer table below for the sources of magnesium. Millions of people suffer from Magnesium deficiency without even knowing about it. Diabetes and pregnancy are two of the most common conditions that make you prone to magnesium deficiency (1) (2). Deficiency of magnesium may cause fatigue, muscle cramps, mental problems, irregular heartbeat and osteoporosis. If you’re magnesium deficient or want to avoid its deficiency then you must include a variety of cereals, pulses, nuts and green leafy vegetables in your diet. 1. Formation of bones and teeth. 2. Helps in the metabolism of calcium and potassium. 3. Improves insulin response by lowering insulin resistance. Having very low magnesium will result in the pancreas not secrete enough insulin to control our blood sugar. 4. Helps maintain nerve function and normal heartbeat. Performing many chemical reactions in our body. Pulses Matki, Rajma, Chawli, Moong etc. Cereals Bajra, Jowar, Ragi (Nachni), Broken Wheat (Dalia) and Whole Wheat Flour. Almond Bhakri, Rajma and Spinach Soup, Jowar Bajra Besan Thalipeeth and Moong Sprouts and Spring Onion Tikki.